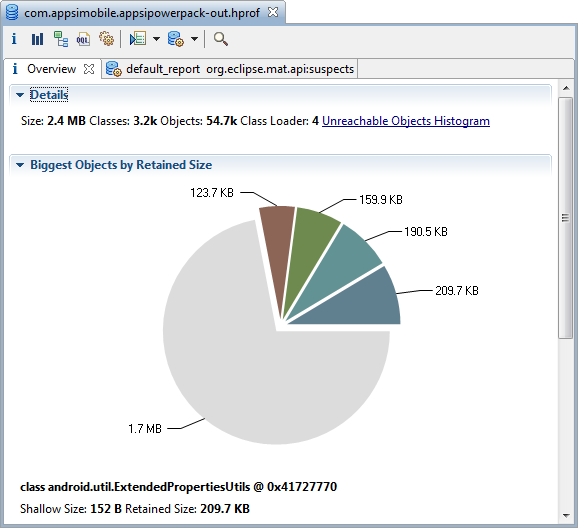 Q: Why is Appsi using so much memory? This is a very good and very hard to answer question. First of all, it has to do with how memory management works on modern operating systems like linux (on which Android is running). The most important thing to remember: Memory can be shared between multiple applications, and this causes both apps to use that memory. According to the memory dump the Powerpack plugin is only using 2.4MB of memory. So how can we explain this extreme difference? It appears that all these resources count as memory used by the powerpack plugin as well. This adds roughly 30MB to the memory usage. Something else is also adding about 50MB to the memory usage. My best guess is that these are resources from other apps used by the powerpack plugin, for example to load calendar data, read settings status (the toggles for example) and the list of recent Apps. The powerpack plugin connects to all kinds of resources to gather this information that count against its own memory usage as well. The same goes for Appsi, it connects to the Android PackageManager to get info about installed apps, it connects to home plugins and DashClock extensions, it may host app widgets that connects Appsi to the AppWidgetManager (across multiple apps). All these things may add up to the memory usage you see in Appsi. For more information (and details how to interpret the different values) see this answer by Dianne Hackborn to a similar question on stackoverflow.com.